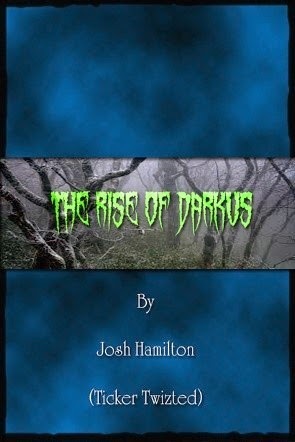 Today we are interviewing author, rock and roll band lead singer, cinematographer, composer, artist and all around Renaissance man, Josh Hamilton (Ticker Twizted) about his sci-fi/action novel The Rise of Darkus. My name is Josh Hamilton but most call me Ticker, reason being that I optimistically embrace my Tourette syndrome. I am a singer, composer, indie film director and writer. My work is inspired by the unexplored world of the supernatural and paranormal realm. I’m fascinated by the afterlife. I was born January 27th 1989 on a NAVY base located in Whidbey Island, WA. I spent most my life hospitalized and reclusive due to the lack of knowledge for TS which I believe is the reason my imagination never had a limit. I yearn to be heard and make a living off of my creativity. I am motivated, have an endless supply of inspiration and always see the best qualities in people. Describe the plot of The Rise of Darkus in a few sentences. The Rise of Darkus is destructive and out of this world. An infusion of obscure and action-packed. People who love to escape our busy world and dive into a new world that takes you on a journey to find one’s self. People who enjoy a love story. People who claim themselves outcasts and can relate to Darkus, who yearn to be heard. People who want to find their own place in a bizarre and cold world and want to fulfill a craving for adventure. What inspired you to write a sci-fi action novel? Being mystified by the unusual and the unknown, sci-fi has always been about that. I’ve always been drawn to discover what lies in the dark. Most people are scared of the dark. I’m eager to light up that path! I’ve never been into anything that is real. To read about things that are already happening to me is dull and hard to keep reading. But when you read a sci-fi book that takes you off of this planet it really is the thrill that I seek. The adventure that I crave. The land of Remains is described as a world that thrives on law, order, and Sacred practices. Is this world based off an exaggerated portion of human society or is it something entirely new? Yes it is. I enjoy mixing societies struggles in my stories. It gives it just that right amount of reality that you can relate to. The frustrations of feeling like you are not in control and that you are a slave to society’s higher class brings out emotions that attach you to the book. As though you are in an entirely different galaxy yet you can still feel that frustration. Both the supernatural and science play a role in reanimation in your novel. Have you always been interested in science? Ever since I was a child I have loved science. Science is fascinating and those who are into it look for a better tomorrow. Science is into the idea of looking into the darkness and revealing a new discovery. I’ve actually haven't read many books honestly. I’ve actually been more into the dialog in films, but I loved Harry Potter and Lord of the Rings. Always been a nerd, always will be. My books are inspired by movie directors and musicians. Tim Burton and Guillermo Del Toro are some of my favorites. The characters in which I write will share physical attributes of rock stars that I idolize. Since music is my primary passion. I also love the way Edgar Alan Po always wrote. He is another favorite. Since I was twelve. I wrote my first screenplay when I was twelve. Before that I was drawing storyboard art, when I was four. Kind of like comic books. I actually came up with this book while working at Spirit Halloween. I enjoyed the fact that each genre of costume had like 5 versions of each creature. Like clowns had 5 versions. I thought to myself, "those could be different ranks in some type of army," and then it hit me. I looked around at all the creatures and saw characters that could be in a book. I loved Halloween; always have. But I didn't want to create an idea where everything was clearly Halloween and the characters in the book new what Halloween was. So I took the characteristics of what we know and made it a serious concept and similarities, but not too obvious. For example, in the book there are creatures called Lanterians. The name sounds like "lantern," like a jack-o-lantern. They appear to be pumpkin-like creatures, but they don't know what a jack-o-lantern is. That’s a tough one. I enjoy Darkus because I relate to him the most, which was the point. But I enjoy Kursus as well. She is tech-smart, a bit sassy, and a bit of a tom-boy. She's sweet but has a ferocious appetite. Her dining manners are atrocious and when she is hungry she will cook a monster on the spot and eat them. Harry Potter, The Order of the Phoenix. It was the book that changed the tides (in my opinion) for the vibe of the series. It brought the darkness into what felt like happiness. It made the story real and brought my emotions out. The book was practically one big twist. I admire that in a writer. Someone who isn't afraid to make the main cast of characters lose. When I read, it’s either a sci-fi story or a book about a topic in something I’m fascinated by, like an encyclopedia of mystical and paranormal events, the Steampunk Bible or an autobiography of an idol of mine. I’ve learned the format very well. At first I wrote what I thought was cool. But then you realize that there needs to be a hook or it just feels like it isn't going anywhere. I learned how emotions play a big role in it. The reader needs to feel something or they won't read it. Love, betrayal, admiration of characters are so important. Not that I can think of at the moment. No examples that come to me. When I write an idea for a book I normally have a well-structured canvas already laid out. The only improving I do is when I had an idea that I thought worked until I get to that point then change it if it doesn't feel right. The dialog is always improvised. If something changes I quickly alter it then move on. I loved choir and theatre. I was the president of my thespian class. Other than that, not much. I never had school spirit. My schools never had the fun stuff like Astrology or Mythology. My science teacher was an English teacher who knew nothing about science so I feel I missed out. Although I did have a website building class. That was fun. I think it’s a great way to get your books out, or read on the go. Science has brought us the ability to make everything portable. I like that. The downside is that the internet also takes away the ability to own a hard copy. Having a book on your tablet is cool, as long as we cherish a hard copy still. Like music; it’s cool to carry your music collection everywhere on an iPod as long as you buy an album here and there. Call me a nostalgic but I believe in holding our roots close and not getting rid of them. There is symbolism in The Rise of Darkus as well that pretty much says "the new stuff is cool but one day we might have to go back to the old stuff." Book wise nothing yet since I’m still fresh. But so far my little sister Ava writing me to tell me that she can't put it down feels amazing. Band wise, I’ve had grown drunk men cry in my arms. As weird as this may sound, it’s incredible to know that your music digs so deep into your fans hearts that they are willing to break their "man" barrier and express their love for what you do; THAT is incredible. That feels bliss. Yes they have, and thank God for it. When I started playing music seriously my father was a bit late to support me. But I knew he'd come around when he saw what I do first-hand. So now he supports everything I do. That tells me that he sees a possible future for me in what I do. That’s all I need. Not really. I seem to like it all. I don't want to appear cocky but creating comes so naturally to me. It’s the business side of it and getting someone to actually sit down and take the time to give my book a chance is what’s frustrating to me. I know that once someone with the resources reads my book they will see potential. It’s just finding someone to do that. Same goes for my music. I’ve never had it for story ideas but have had it with music. Normally finding intricate ways to sing along to Cody's (guitarist) riffs can give me writers block as well as finding lyrics that fit with what we are doing. Oddly enough, till this day I have never had an issue with writing a story, and I’ve written over 20 full length scripts! Again, I don't mean to sound arrogant, that’s just a fact! I use a computer. My mind is always racing with ideas. At times I will have a cluster of ideas at once. When I use paper and pen I can't seem to write as fast as my thoughts but with a computer I can type in quickly all of my ideas in just seconds. I use my notepad app on my phone as well. It’s convenient and I always have it, rather searching for paper then a pen and possibly forgetting my idea. Well I’m going to write the next Rise of Darkus novel. I want to start writing my other stories in store but don't know when. I’m just waiting for when it feels right. But the next sequel to Rise of Darkus is the Call of the Crophix. I don't want to give anything away but what I can say is that this sequel is about Darkus learning more about himself. He also discovers an ancient race that aids him in his quest. The Hybrid Mentus is what they are called. It’s also about making hard decisions. Darkus has no choice but to do something he doesn't want to do for a short period of time. I think we can all relate to that. I just hope it captivates them like I’d intended. I hope it takes you on a journey. I hope you fall in love with the story.